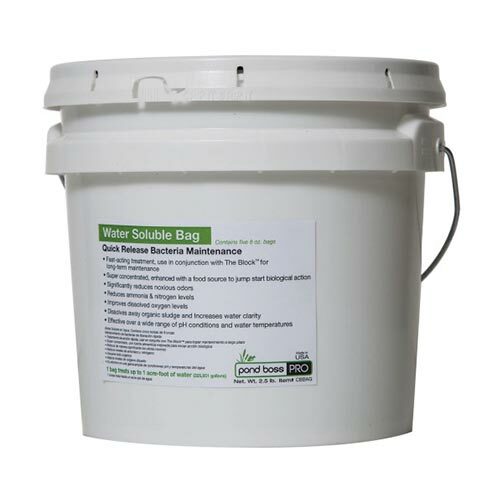 The pond boss® PRO Water Soluble Bags are a fast acting treatment. The self-dissolving bags allow easy application for an ideal start-up treatment. Its super concentrated formula is enhanced with a food source to jump-start biological action. The quick release formula helps improve oxygen levels, eliminate odors, reduce high nutrient loads and increase water clarity. One 8 oz. bag treats up to 1 acre-foot (325,000 gallons) of water*. For optimal results, use the soluble bags with The Block™ every 60 days to reduce maintenance costs.